There aren't a lot of places to get M2 hardware these days. Your local hardware store likely won't carry it (most don't even carry #2-56 screws, 4-40 being the smallest they stock). Luckily, your hobby store probably has them. The 1/18th scale car craze is great for us robot builders: a number of the models use M2 hardware. 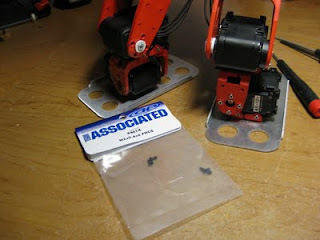 The picture to the right shows Reaver's feet attached, using M2x4mm screws from a hobby shop. Speaking of Reaver's feet, they look familiar, eh? Much of the SES stuff that doesnt specifically hold servos, is compatible with Bioloid if you're creative. The Bioloid brackets hall have 5/8" x 5/8" patterns, which align with many of the SES add-ons. Reaver is using a pair of BRAT feet, and I'm sure everyone has noticed that Issy has SES tube-style legs. I'd like to send out a big thanks to all of our beta testers. 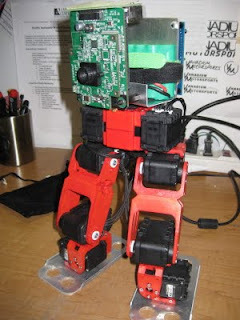 They've been hard at work testing the heck out of the arbotiX libraries and PyPose. I spent some time the other day working with Seth and Ben to refine the PyPose interface. One of the major changes we've made is to lock the servo position sliders when a pose is not selected for editing, this has made the interface much more intuitive to new users. This evening I spent a while working with Jodie to get her board working with an STK500. I've been using an AVRISP in house for a while, but one of the things I've been doing is carrying over my heavily modified boards.txt and programmers.txt files from release to release... Apparently, somewhere along the way many things have changed in what the stock file now is, which caused a great deal of confusion tonight. Needless to say, I'll be revisting my boards.txt and programmers.txt files tomorrow, and updating our wiki with a better walk through of setting up programmers. Anyone who has tested PyPose will notice we have a menu called Tools, which really only has the Pose Editor and the Sequence Editor. Looking towards the future, I'm working on two major tools that will be in future releases of PyPose later this Fall. The first is NUKE, the Nearly Universal Kinematics Engine. 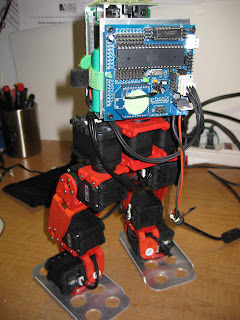 NUKE will allow users to setup and export an Arduino project comprised of a complete IK engine, custom tuned for the quad or hex, and a periodic gait engine. The second tool will be a command line style interface within PyPose that will allow you to query and edit anything connected to the Bioloid bus on your arbotiX. A final note is that we're actually running ahead of schedule here at Vanadium, on both the hardware production and software testing fronts, so you should see the arbotiX on shelves at Trossen by the end of the month! It's finally here! 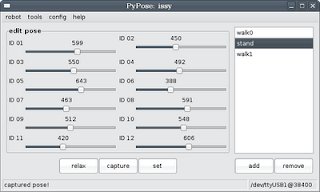 PyPose V0.91 is a complete rewrite of the software, using wxPython as the GUI package. It's world's better than the old release. One of the great new features is that we finally have a sequence engine. All of these features have been in the works for a bit, just need finishing touches. I'll also have a video shortly walking through the whole process of creating poses and sequences to make a little droid walker. I've been talking lately about building a walking fire fighter, but I've now finally started transforming Issy from a mech into a Fire Fighter. Issy's new body is about 2" shorter in both the width and length direction, a necessary adjustment to get him under the 12"x12" rule (yes, I know the Trinity contest allows walkers to be 12"x18", but I intend to take Issy to CNRG, and possibly RoboGames next year, and neither contest has a walker division, so the 12"x12" rule had to be followed). Issy has a head similar to what I had on GMR. The head has an IR ranger for 99% of his navigation, a sonar ranger mainly for approaching the candle (since the IR gets wiped out), an IR photodiode for fire detection (similar to Crater's sensory), and a ducted fan for fire extinguishing. 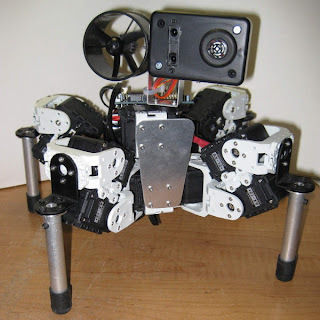 Issy is sporting a new arbotiX robocontroller, and power is from an 11.1V 2200mAh LiPO. Early tests with IK have shown quite a bit of promise as far as odometry from walking - I've still got a ways to go as far as implementing a geometrically stable gait. Issy's code will basically be another rework of Crater's (cause heck, it works). These fairly cheap upgrades save a lot of time, I think I've cut the amount of time spent on assembly by at least 50%. Just make sure you have a GOOD set of hex drivers. 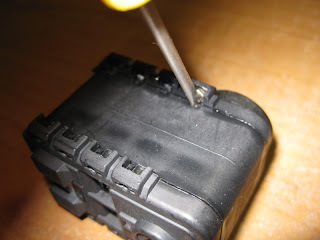 Line the nut up, use a flathead screwdriver to push the nut into place.